Fresh install from Xubuntu DailyBuild (14.04). If this is a fresh install then ubuntu-release-upgrader is not the correct package. ubuntu-release-upgrader deals with upgrading from one release to another. The "en_US" label you see at the top bar of the login screen is the display language, which I see from the attached ProcEnviron.txt that you set to English. Actually it's a language chooser indicator, so if you click it you see a list of installed translations, and you have the option that way to control the display language of the session you are about to start. OK, sorry, I thought It was a way to configure the keyboard. 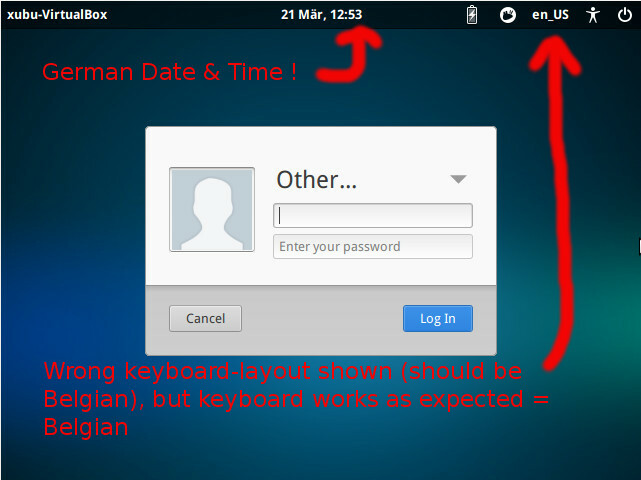 By the way, if the language is set to "en-US", which is the case, can you explain then why the date and time is shown in German? Because the installer guessed your desired regional format settings based on the time zone location, and picked the de_BE.UTF-8 locale. You can change that, if you like. Open Language Support and select the "Regional Formats" tab. To make the change effective on the login screen, you also need to click the "Apply system-wide" button.